What is Contemporary Urban Anthropology? “Contemporary Urban Anthropology” is a theoretical real estate and urban planning concept that applies an anthropological approach to understanding our “built environment,” and facilitating “best practices” to modern urban planning, development, redevelopment, obsolete facility reuse, and real estate end-user site selection analyses. 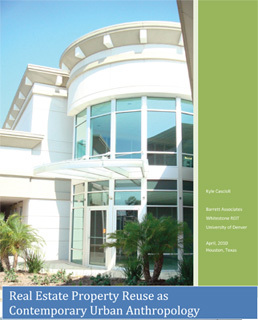 In this context, real estate practitioners in all the above described disciplines – who in theory are building the relics of tomorrow today – can determine and modify the traditional real estate appraisal definition of “highest & best use (HBU),” to include qualitative factors that consider the most appropriate use and design relative to urban and suburban real estate utility. Real estate utility is determined by a given real estate improvement’s functional contribution to its surrounding environment relative to anthropological and cultural considerations. These considerations contemplate where people of a given community live, work, learn, recreate, worship, do commerce, and takes into consideration current economic and business cycle characteristics. This contemporary anthropological approach to real estate also considers a given community’s physical characteristics including topography, geology, hydrology, infrastructure, climate, and others. Download our paper "Real Estate Property Reuse as Contemporary Urban Anthropology." Over the last 15 years cities have provided, with the assistance of the Department of Housing and Urban Development (HUD), an increasing amount of affordable housing for the nation’s poorest families. Even with the growth of HUD assistance programs the nation’s supply of affordable housing is currently insufficient to meet demand. Urbanisation is as advanced in the USA as in any other country. Americans, however, have long yearned to escape the city and stake their claim on the open frontier. Suburban and exurban expansion is now complicated by environmenta; constraints, primarily the availability of cheap ol and, in the American West, water. This condition has encouraged some population movement back to the city centre. Nonetheless, the promise of a better future out on the frontier--the 'Paradise Spel'--remains a powerful impulse in American life. Bravo Metro Wastewater Reclamation District for not exercising its Eminent Domain authority in Brighton! The Metro Wastewater Reclamation District (MWRD) recently paid for 84 families and businesses to relocate in order to make way for the district’s new $470 million dollar wastewater treatment plant in Brighton. MWRD District manager Catherine Gerail was quoted as being very pleased that the city was able to help all parties move to new homes—including a colony of feral cats that now occupies a new space at the Brighton Animal Shelter. We’re pleased too! Former mayor Federico Peña once implored Denverites to “Imagine a Great City.” The Denver Post is regularly filled with opinions about how we might build something more akin to a “Good City.” The concept of Good City was first introduced in the 1960’s by the philosopher Lawrence Haworth. Haworth believed that the Good City must offer its citizens economic opportunity as well as the means to build strong community. He noted that these two “ingredients” are often in conflict, so they need to be carefully balanced. Today the Good City is also conceptualized as one that is environmentally sustainable.